1. MINWAX 62127 HARDWOOD FLOOR CLEANER SIZE:32 OZ. 2. MINWAX 78500 REGULAR PASTE WAX SIZE:1 LB. 3. MINWAX 13613 RED MAHOGANY 925 WOOD PUTTY SIZE:3.75 OZ. 4. MINWAX 22718 EBONY 2718 STAIN SIZE:1/2 PINT. 5. MINWAX 13617 WALNUT 924 WOOD PUTTY SIZE:3.75 OZ. DiscountPaint.net :: MANUFACTURERS :: MINWAX :: MINWAX 78500 REGULAR PASTE WAX SIZE:1 LB. MINWAX 78500 REGULAR PASTE WAX SIZE:1 LB. Minwax® Paste Finishing Wax protects and adds lustre to any stained or finished wood surface. 1.All surfaces must be free from dust, dirt, grease etc. 2.Apply a thin, even coat of Minwax® Paste Finishing Wax with a clean cloth. A thin even coat can be conveniently applied by placing a small quantity of Minwax® Paste Finishing Wax in double thickness of cheese cloth and applying only the amount that works through cloth as it is rubbed over surface. 4.Polish with a clean cloth, weighted buffer or electric polisher. 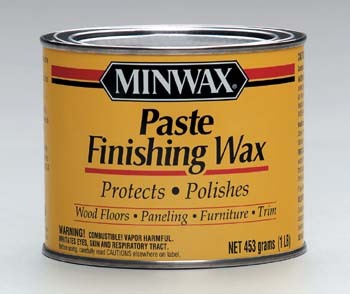 This Minwax® paste finishing wax produces a hard, dry, oil-less polish. SUPREME CHEMICAL 72032 DC32 DRIVEWAY CLEANER AND DEGREASER SIZE:32 OZ. FOAMPRO 00163 2" FINE FINISH ROLLER REFILLS PACK:2 PCS. CABOT STAIN 11708 MEDIUM BASE THE FINISH W/ TEFLON SURFACE PROTECTOR SIZE:1 GALLON. MODERN MASTERS PSMP709 POLO BLUE PLATINUM SERIES METALLIC PLASTER SIZE:1 GALLON. THOMPSONS TH.024111-03 WATER SEAL CLEAR MULTI-SURFACE WATERPROOFER LOW VOC SIZE:1.2 GALLONS. SHEFFIELD 1716 RICH GOLD LEAF SIZE:2 OZ. ALLWAY SEB112 #12 BULK RAZOR BLADES PACK:100 PCS. 3M 06965 4-1/2" X 5-1/2" X 3/16" FINE CONTOUR SOFTBACK SANDING SPONGE PACK:250 PCS.